The Maritimo S50 is an evolution of the popular M48 which is claimed to have sold more than 100 vessels around the world. The original hull has been stretched slightly to 53 feet to create a little more internal volume and I think it shows with improved sleekness in a profile view over the M48. The "S" stands for sedan on the Maritimo S50. On sedan boats it is quite common for the engine room to be a tricky proposition to get right. On this boat, the engine room is best described as a really clean space (in "surgical white" according to Jeff Strang). 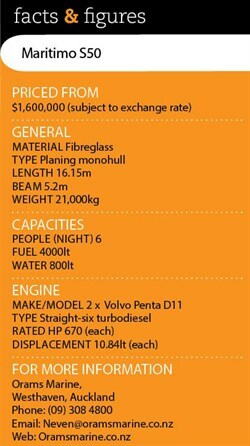 There is plenty of room around the D11 670hp Volvo Penta shaft-drive engines. Neatly fitted in the engine room is the watermaker which augments the 800lt freshwater tank as well as the 17.5kva Cummins Onan generator. Maritimo builds its boats with the intention of keeping down the cost of boat ownership and according to Jeff Strang, this is evident in this space through good, hard-wearing, low maintenance, heavy duty equipment. 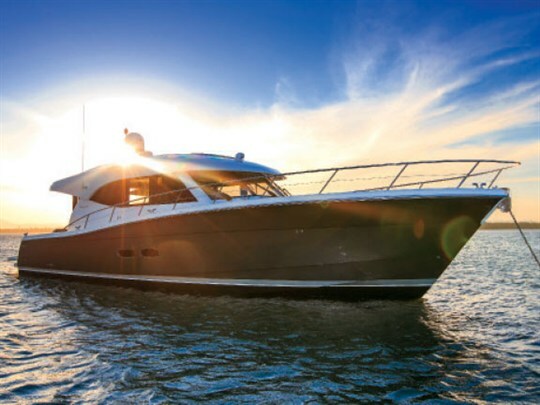 The sedan style of the Maritimo S50 gives the helm a sense of "inclusiveness". The helm station allows passengers to see what the skipper is doing and, if necessary, get involved in the action without interfering. Warm, high gloss, varnished timber panels welcome guests to their accommodation. There is plenty of capacity for a family: a children’s cabin is located on the starboard side; a double VIP up for’ard the ensuite day accommodation is also located on the starboard side. The Maritimo’s S50 very inviting master cabin is centrally located in full beam. It has en suite access at its top level along with spacious wardrobes and even a writing desk. A Queen-sized island berth with a somewhat unusual diagonal configuration changes the way space is used, offering space to walk around. The small tweaks in the saloon made a noticeable difference to its comfort, while the wide walkaround decks and robust handholds add real surety for those navigating the bow. There is also simplicity in the design which makes it easy to keep clean and tidy – something that will get big ticks from owners a long time after they have received the handover.